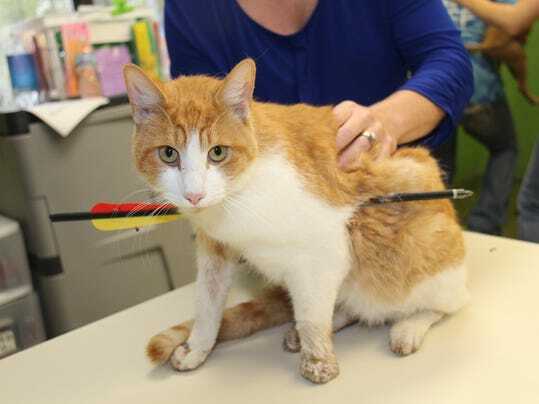 This Cat Was Found With an Arrow Through His Body. Let’s Find the Monster Who Did It! On October 5, 2015, Eaton County Sheriff’s department responded to an unusual distress call. A local resident found a wounded cat with a crossbow bolt through its abdomen underneath her deck. Animal Control caught the cat and delivered it to the Capital Area Humane Society for care. This little guy had a crossbow bolt through his torso. He must be in a lot of pain, but he’s hanging in there! Despite the trauma of the incident, the cat was very kind and willing to being touched. What’s even more important is that the cat didn’t show any signs of labored breathing which would have indicated lung damage. The cat’s guardian was identified, but she was elderly and could not afford the expensive surgery it would take to remove the arrow, luckily the Capital Area Humane Society performed it free of charge! The kitty made it through the arrow’s removal and is now recovering at the humane society. The surgery went smoothly, but the recovery will take some time. It is also unclear whether the injury will have any long-term effects on the cat’s health. For now he’s heavily sedated to help him heal. 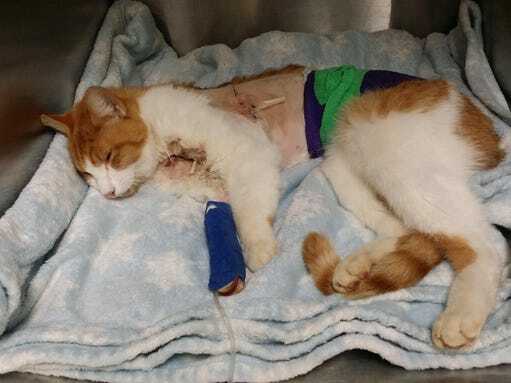 The Eaton County Sheriff’s office is doing all they can to find the person who did this to the cat and have offered a $1,000 reward for any good information that leads to the perpetrator’s capture. If you happen to have info that can help the police, please contact the Eaton County Sheriff Department Tip Line at (517) 543-3512 or CAHS at (517) 626-6060. This cruel individual needs to be brought to justice. If you don’t have any info but would still like to help, please donate the Special Care and Cruelty Fund that goes to help animals like this kitty.